- Buy Automatic Shrink Wrap Machine from Zhangjiagang Modern Machinery Co., Ltd.
1.This automatic shrink wrap machine is Frequency control, Secondary bottle transport device. 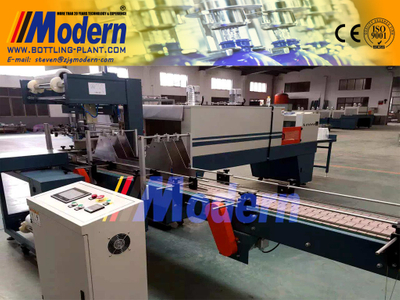 2.The whole set which are push bottle, heat sealing cutting adopt pneumatic structure. 3.Inductive switch control film length. 4.Touch screen, PLC control system advanced reliability of the equipment function. 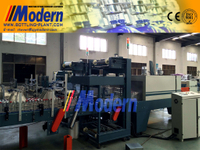 5.Circular wind machine, require well-proportioned temperature of the shrink furnace. 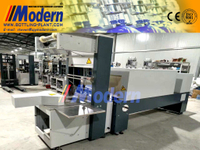 6.Wrap shrink packing machine strong cooling system can reassure finalize the design quickly. 7.Heat-fast Teflon transport net, transport steady, high strength and stand wear and tear. 8.Frequency conversion timing net transportation structure. 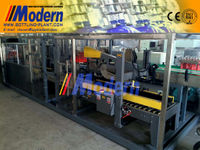 11.Automatic Shrink Wrap Machine pterodactyl stainless iron heating system, durability. Satisfy the bear storage rack device of the short duration for the product,assure consecutive work for the production line.